When Yury was twelve, Yury’s parents took him on his first climbing trip to the Caucus Mountains . 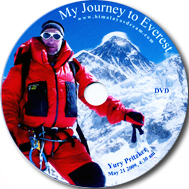 From his late teen age until 1989 Yury climbed mountains once or twice a year, summiting Mt. Elbrus in 1984, the highest mountain in Europe. In 1989 Yury with his wife Svetlana and their two small children left Ukraine , their homeland, and immigrated to the United States of America. They came here as refugees with $500 in their pocket and four suitcases filled with bare necessities. This journey as well as adjusting to the life in a new country was not easy, but in 2003 Yury started climbing again, this time together with his grown up son Yan. 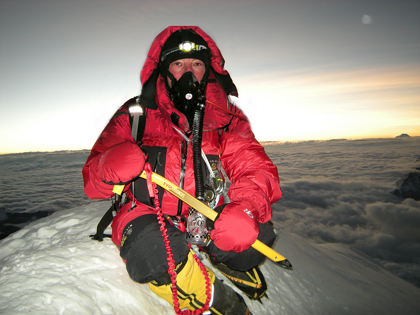 Among many summits climbed over the years, Yury’s significant achievements are: Mt. Denali – the highest summit in North America , climbed in 2007 via the Upper West Rib route; Mt. 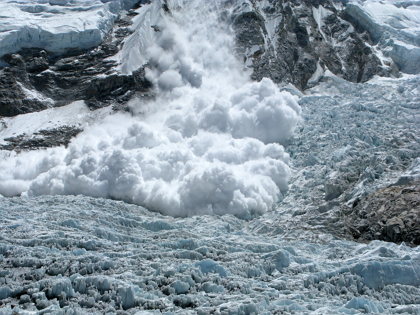 Everest – climbed in 2009 via the South Col route. Yury lives in Chicago and works as a software architect. He loves traveling around the world, seeking the thrill of climbing. In his spare time, when not climbing, he enjoys skiing, scuba diving and dancing Argentine tango. 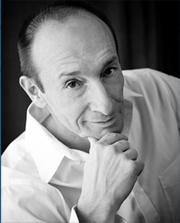 He is also inspirational speaker and workshop co-facilitator with his wife Svetlana. In addition to playing an integral role in her educational and spiritual work, he conducts sound healing sessions using quartz crystal bowls. 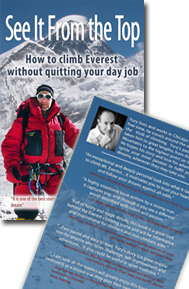 Yury’s passions have taken him to great lengths; from the Caucasus Mountains to the highest point on the planet. He hopes his story and love for adventure will ignite your inner passion to fulfill your own dreams, wherever they may take you.